Keep up-to-date with our latest news. Read the full articles from the links below. Upcoming events will be announced shortly. 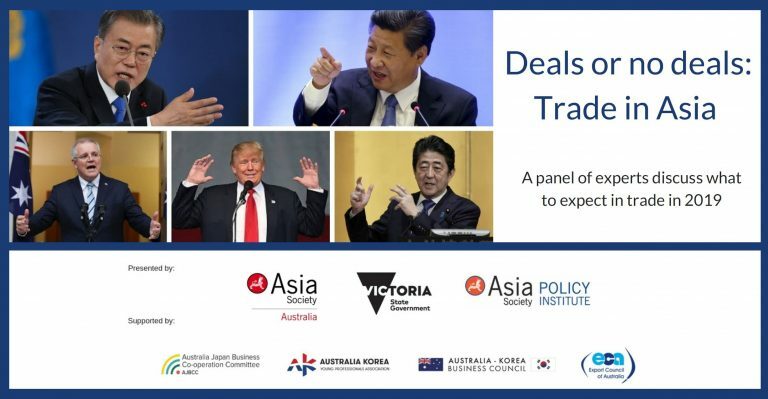 AKYPA in partnership with Asia Society hosted a panel discussion that explored the implications of the US-China Trade war on the region, developments in regional trade agreements (TPP, RCEP) and offered insights for navigating and bolstering the international and regional trading system. AKYPA hosted a networking evening for AKYPA members & guests to celebrate the new year. 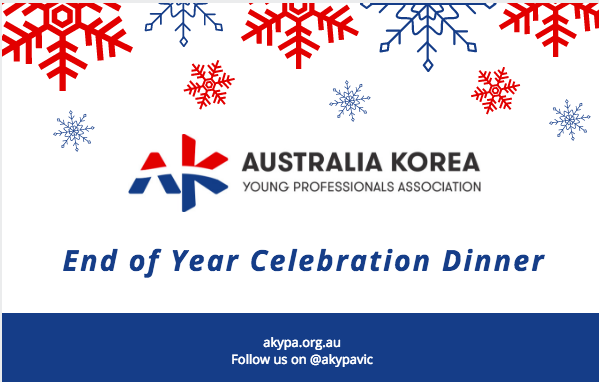 AKYPA believes that the future of the Australia-Korea bilateral relationship depends on Australia and Korea’s young professionals working alongside to achieve optimal outcomes for both nations. 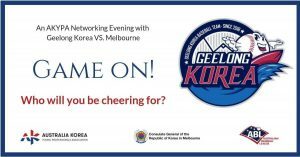 The Consulate General of the Republic of Korea in collaboration with the Australian Baseball League invited AKYPA members to a KOREA-AKYPA Networking Reception at the Geelong Korea VS. Melbourne baseball game in a private suite. 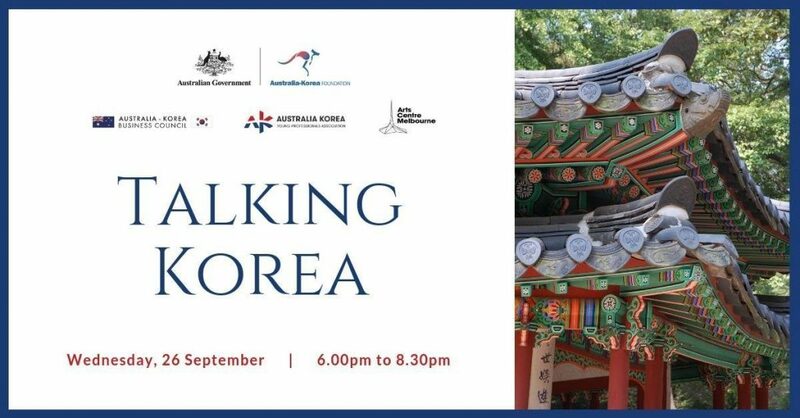 AKYPA in collaboration with the Australia Korea Foundation, the Australia-Korea Business Council, and Arts Centre Melbourne hosted "Talking Korea'', a networking evening to engage on everything Korea. 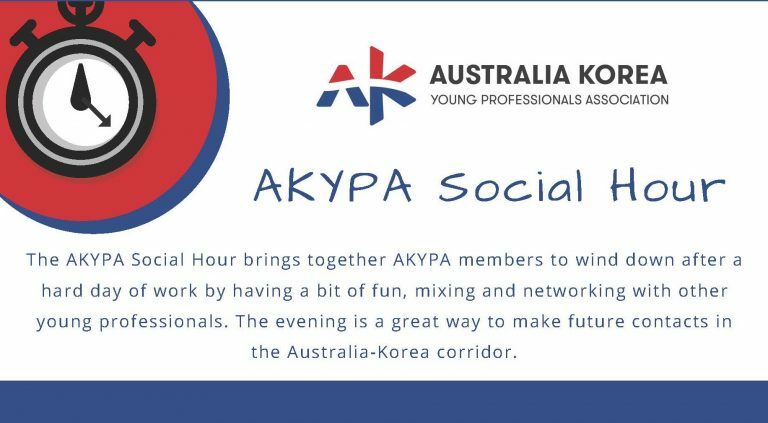 The AKYPA Social Hour brought together AKYPA members and other young professionals for an evening of fun and a chance to network with like-minded people interested in a whole range of Australia-Korea matters. AKYPA in partnership with Australia-Korea Business Council hosted a boardroom briefing with H.E. Mr James Choi, Australian Ambassador to the Republic of Korea. 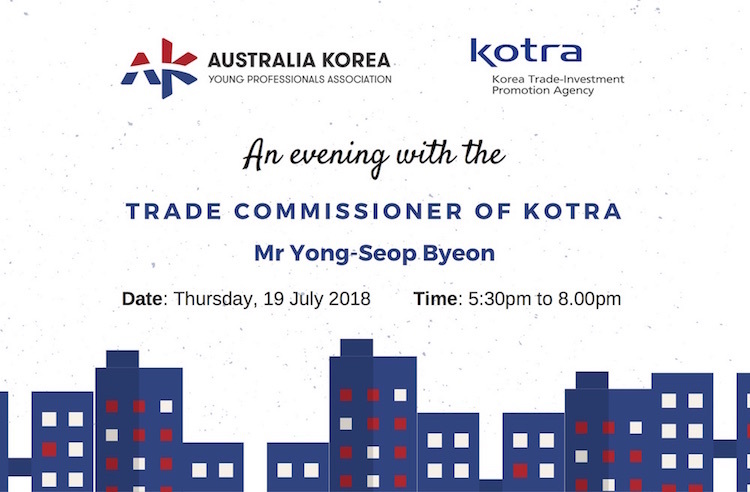 AKYPA in partnership with KOTRA hosted an evening in the company of the Trade Commissioner of KOTRA, Mr Yong-Seop Byeon who shared his knowledge on Korea's trade and investment landscape. 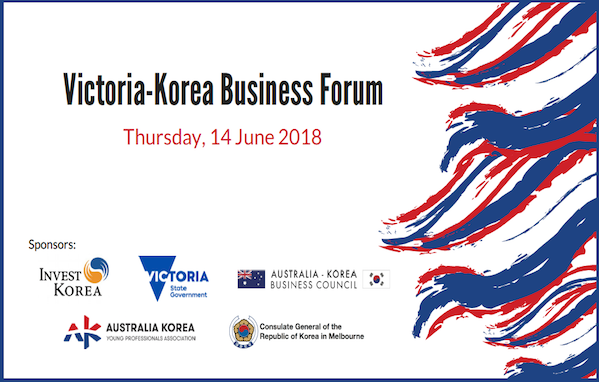 The inaugural Victoria-Korea Business Forum 2018 (VKBF) held in Melbourne, was an opportunity for representatives from the Victorian and Korean business communities to come together and discuss the latest trade and investment opportunities. View photos from the forum. 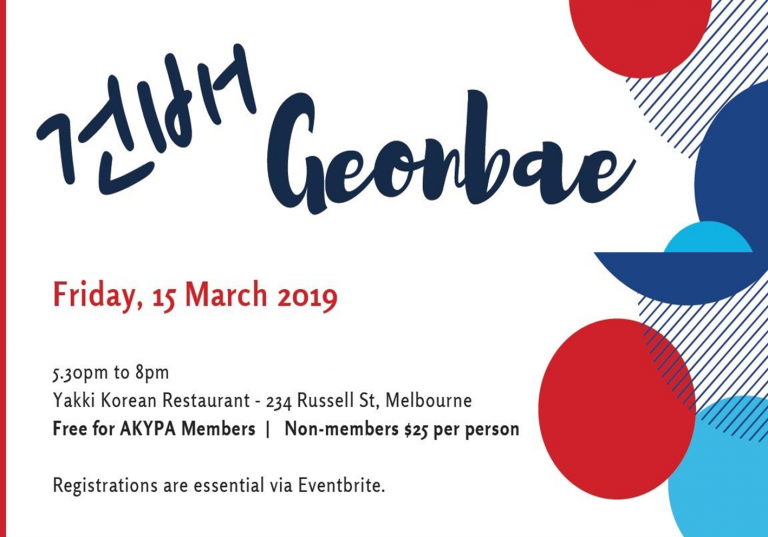 We celebrated Seollal (Korean Lunar New Year), one of the most significant traditional Korean holidays marking the beginning of a new year with a networking evening, where members and guests got a chance to meet and network with like-minded people. View photos from the networking evening. 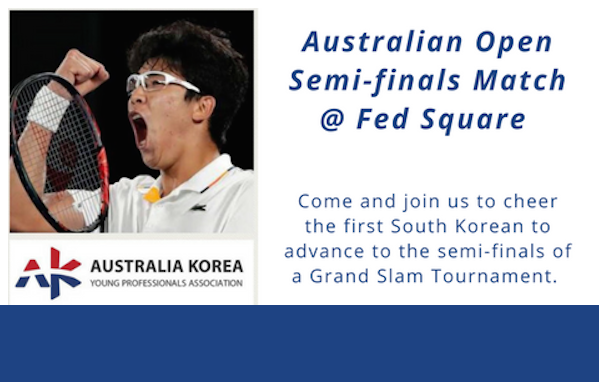 AKYPA organised for its members and followers to meet at Federation Square to watch the Semi Final match of the Australia Open between Chung and Federer. This event received media coverage by The Age and SBS World News. 2017 was a great year with the launch of AKYPA. So we took the opportunity to celebrate our success and achievements with our members and guests at an End of Year Celebration Dinner in Melbourne. View photos from the celebration dinner. 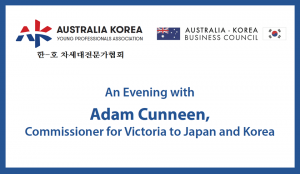 AKYPA in collaboration with the Australia-Korea Business Council hosted a boardroom briefing with Adam Cunneen, Commissioner for Victoria to Japan and Korea. Mr Cunneen shared his deep knowledge and insights into the opportunities for Victoria in the areas of investment, trade, education and tourism in South Korea. View photos from the boardroom briefing. 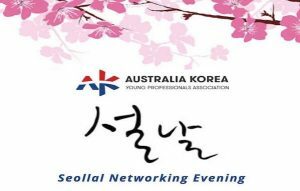 The Australia Korea Young Professionals Association (AKYPA)’s Victorian Chapter Launch Event was held on 5 October 2017 in Melbourne. ANZ Australia CEO Shayne Elliott gave the keynote address on Korea being a business destination while Former Australian Ambassador to South Korea Bill Paterson PSM shared his thoughts on the incredibly important and strategic nature of the Australia-Korea relationship.